Sticking with the familiar, I used David Lebovitz's chouquette recipe. You might remember I had a mishap with watery dough the last time I made eclairs with this very similar recipe so I've taken what I've learned and applied it here. In essence, you need to cook the dough an extra minute or two on the stove, over heat, to dry it out. I had no problems at all. I piped the mounds out and topped them with an egg wash and then the coarse sugar. You can make them smaller for truly bite-size snacks if you like. 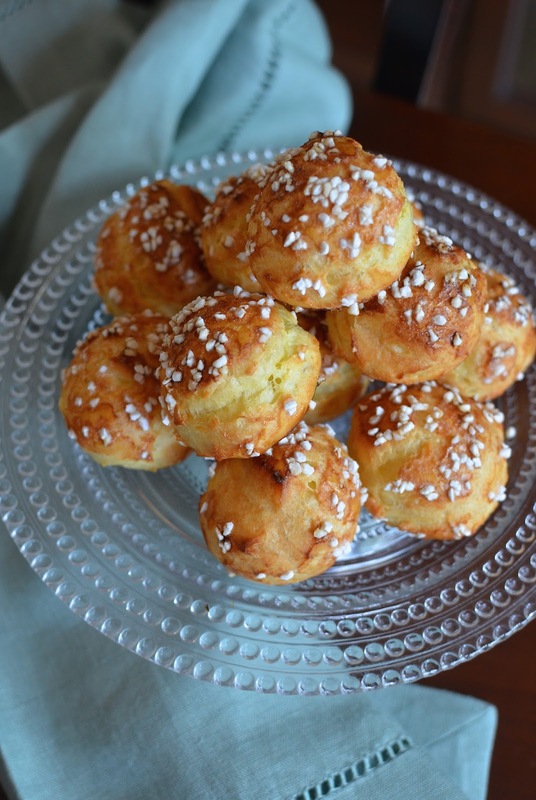 I mentioned in the past that I picked up some invaluable choux pastry cooking tips/instructions from Dorie Greenspan in her latest book; she also has a chouquette recipe there. Her recipe calls for an extra egg to make for a more custardy center and she uses some milk (instead of just water) in her pastry. 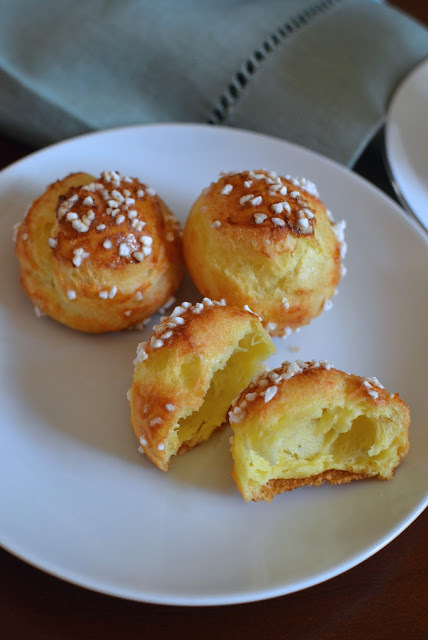 It should make for a slightly richer, more tender chouquette if that sounds more appealing to anyone. One thing that kept me from making chouquettes was getting my hands on the coarse sugar! What you want is the Swedish pearl sugar, pictured on the right in the photo above. I ordered it online but I hear Ikea carries it! I wanted to mention that you don't want Belgian pearl sugar (how confusing...), which is far bigger and used for liege waffles. Admittedly, I don't even have a waffle maker but I like to plan far in advance so when I saw the Belgian pearl sugar at Sur La Table recently, I decided to buy it! The puffs take about 25 minutes in the oven and then they're ready to be served. Ideally, you want to enjoy these soon after they come out of the oven. I can attest that they go really well with a cup of coffee, as part of breakfast or as a midday snack. They are infinitely snack-able! They also go nicely alongside your meal. After all, they are very much like popovers. Transfer the mixture to a piping bag fitted with a plain 1/2 inch round tip, or simply cut an opening in the bag. Pipe dough into small mounds, whatever size you like though small is traditional, evenly spaced apart. Lightly beat the egg and milk together to make an egg wash. Gently brush the top of each with some of the egg wash. Use the brush (or wet fingers) to smooth down any pointy ends. Top each with coarse sugar, pressing a generous amount onto the top and sides of each. Bake until puffed and well-browned, about 25-30 minutes. If puffs get too dark midway through baking, turn oven temperature down to 375 degrees and continue baking. Remove baking sheet from the oven and let cool on a cooling rack. If you want them crisper, you can poke the side with a sharp knife or skewer after you take them out of the oven to let some of the steam escape. These are best eaten fresh or the day they're baked. Once baked and cooled, you can freeze them for up to a month in a freezer bag. Defrost at room temperature and warm them briefly in a moderate oven, until crisp. Choux pastries are my husband's favourite. He surely will love those adorable chouquettes. These are adorable!! I'm thinking they would be perfect at brunch or after dinner as a sweet bite that's not too overwhelming or heavy. I've always wanted to try making cream puffs so thank you very much for the tips and inspiration! These are lovely and that pearl sugar is fascinating! They are awesome - looks so hard to make (to me anyway) but in fact, the dough comes together in minutes. I need to make these more often. Everyone seems to like them - I think because it's just not that sweet. These definitely are so nice and airy! And look so impressive - how fun would these be to serve to guests! Especially when you're looking for something that isn't super duper sweet! I was really happy they turned out well...there's nothing like peeking in the oven and seeing the puffs risen and golden! These don't taste like egg waffles at all but the idea is the same, right? : ) They are really good with a coffee...seems such an indulgence but actually not. Thanks, Kelly. It was so fun to pass them around the table and enjoy them in a group! Hope you try a batch, in some form since there are so many choices of what to do with them, soon! I know they'd be amazing. The fancy sugar totally take them to a level that I deserve no credit for. It's like magic. : ) And thanks for catching that about the waffles...one day, girl! Gosh Monica! I can't keep up with you and your delicious culinary delights. I was going to comment on your macarons when these gorgeous choquettes appeared in my browser! These look wonderful and very consistently sized. Glad you managed to get the pearl sugar. You did a great job! Hope up you are having a good summer. Jo - I totally remember your beautiful choquettes! You inspired me and I had to get that pearl sugar and make them given your testimonial. They are just fun (and now, easy) to make! Thank you for swinging by. It's so nice to hear from you. It's busy but we're still ticking along. I can't seem to stop cooking/baking/blogging. I suppose since I am just trying out recipes that interest me, not developing anything or doing anything remotely professional, I have a lot of material so I keep posting! :) You enjoy your summer and family time. Hope we get to see something on your blog soon. Take care! 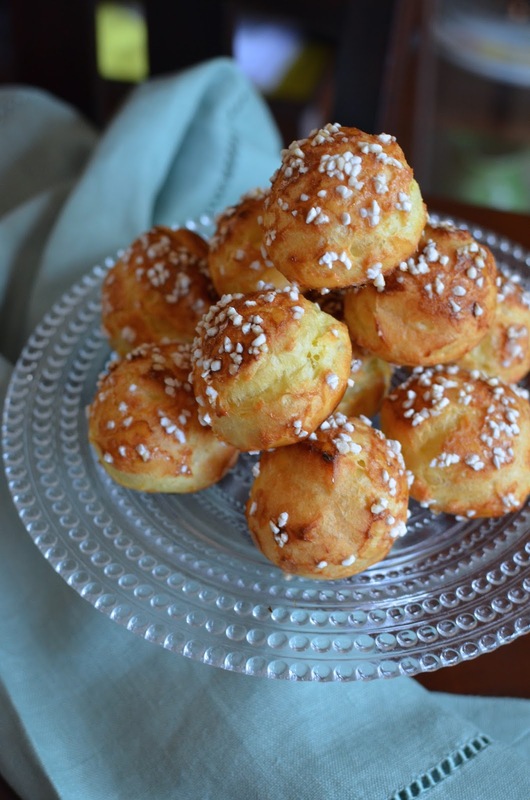 Why have I never heard of chouquettes before?? I need these in my life!! I almost can't believe they just magically puff up like that in the oven when the dough was just a simple cook on the stove then stir-together. It's great! Hi Monica, you are such a great baker, these sound so perfect, I love desserts like this......light and airy and a little sweet. Great way to start the week-end! Nice!! I'm guessing those are a little richer and bit more custardy. Dorie Greenspan is a great baking resource/teacher for sure! I would eat about 30 of these because they look that good (and I'm a bad girl). Yum! Thank you - cream puffs are such a treat...great you used to make them and I hope you do again soon. Looks insanely delicious! I love it! Thanks - they are fun to make. Simply damn delicious for starting a day!!! That sounds like a perfect breakfast! I'm sure your family appreciated the wonderful meal you made for them. 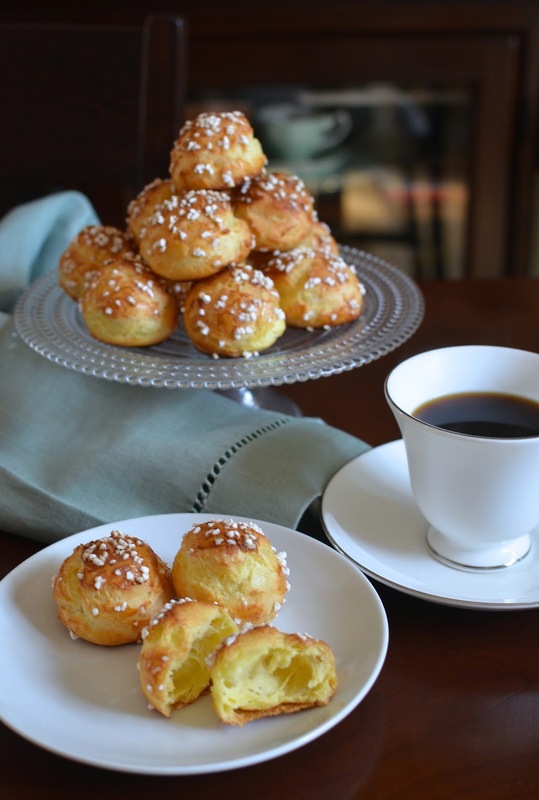 You are so right, choux pastry is so versatile!! Love these chouquettes. Well...I often leave things on my "list" for years and then sometimes I see something I need to make right away. It's funny that way. These are almost like cheating..they're so much easier than they look.